Located about an hour south of San Francisco, Palo Alto is located in the heart of Silicon Valley and is best known for being the home of Stanford University and its warm weather. The university itself is definitely worth checking out (if only for its stunning architecture), but make sure to set aside some time to explore other highlights in the area. Whether you decide to make it a day trip from SF or stay a few days, here are the top things to do in Palo Alto and the surrounding area that should be on your list. Located in Mountain View, this museum is dedicated to preserving the history of the information age and the technology that came along with it. Interactive exhibits include the opportunity to sit in a self-driving car to trying your hand at coding. There are also rare artifacts on display like one-of-a-kind computers, including an Apple I. If you’re interested in learning about the innovative history of the area, this should definitely be on your short list. Closed Monday and Tuesday. Start at the Main Quad, (including the Memorial Church) which is the historic and academic heart of campus. Drop by White Plaza for merch at the Student Store. Other on-campus highlights include the Hoover Tower, the Rodin Sculpture Garden, the Arboretum, and the impressive Cantor Arts Center. 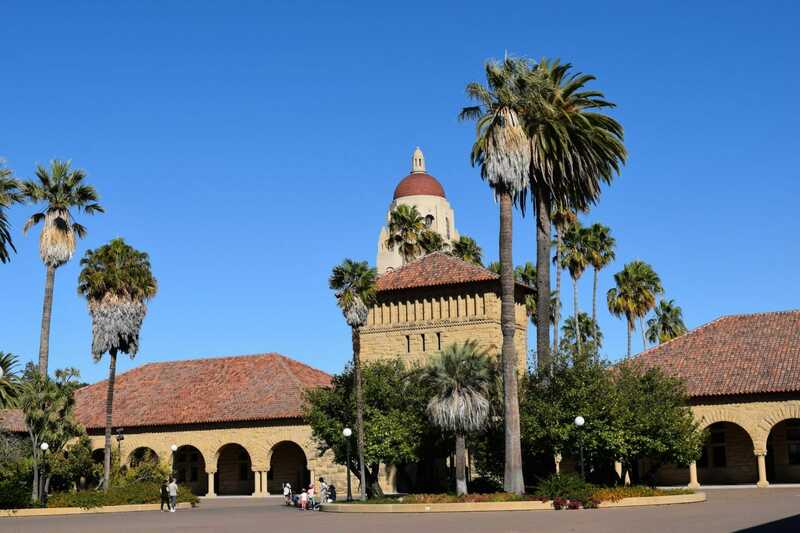 If you want to learn more about the history of this famous university, join one of the free guided tours that leave from the Stanford Visitor Center. Know as the Birthplace of Silicon Valley, this humble garage is where Hewlett Packard was started in 1938. This private property is not open to the public, but visitors can still view the garage along with a commemorative plaque out front. The address is 367 Addison Avenue in Palo Alto, just keep a lookout for the forest green garage doors located behind an iron gate. There’s plenty to see and do in downtown Palo Alto, including notable restaurants and shops along University Avenue. Stop by the beautiful historical Stanford Theater for a classic movie and if you’re around before or after the 7:30pm show you might hear the Mighty Wurlizer Organ. Located in neighboring Mountain View, this informative museum has exhibits on all things space, including models of a lunar glove box and a Mercury Redstone capsule, as well as life-sized cutouts of historical Mars missions. There is also a gift shop where you can purchase unique NASA souvenirs. Double check the hours here. Update: as of 1/15/18 this visitor center is currently closed due to lack of government funding. A lively stretch of shops and restaurants on Castro Street, that is great for wandering around on a warm day. Grab a coffee at Red Rock Cafe, where there’s a spacious second floor overlooking downtown. The dining options are diverse and delicious, including Cafe Baklava, a Turkish restaurant with great breakfast options. There’s a farmers’ market every Sunday from 9-1pm in the Cal Train Parking Lot. One of Palo Alto’s best outdoor spaces, where you can take a break from city life. You can go on a short walk, a longer hike or a half-day bike ride. The scenic marshland has plenty of wildlife sighting opportunities, including ample bird-watching with over 15 miles of easy, walking trails. During non-summer months, bring an extra layer, since the wind can pick up quickly. The corporate headquarters of Google located in Mountain View, is a great place to wander around and soak in the atmosphere of one of the largest tech giants in the world. The campus itself is huge (12 acres to be exact) and the public is only allowed on the outside grounds. From the multi-colored bikes, to the famous Google sign, plenty of photo opps abound. These adorable animals are local celebrities, and have been part of a long time tradition of donkeys in Barron Park since the 1930s. The donkeys are located on a farm that is right by a walking/biking path that you can take a nice stroll on afterwards. Currently, Jenny and Perry (who was the inspiration for the donkey in the movie Shrek) reside on the property and if you’re lucky will come up and say hi. Situated near Googleplex, this scenic park has plenty of outdoor activities including kayaking and paddle boating on the lake, as well as walking trails around the surrounding marshlands for strolling, running, and biking. There is also plenty of space for picnics on the surrounding lawns, as well as a bistro on-site that serves burgers, salads, and sandwiches for lunch. Parking can be a bit difficult on the weekends, especially if there’s an event going on. There’s no shortage of good spots to eat in Palo Alto, but one of my favorite restaurants hands down is Esther’s German Bakery in nearby Los Altos. They have a menu full of German comfort food, as well as a bakery and a biergarden out back. Anatolian Kitchen is also a top choice if you’re craving Turkish food. Odori Sushi and Teppanyaki is great for Japanese food. Staying at one of the many hotels on El Camino Real is recommended for those wanting to be close to downtown Palo Alto and Stanford University. Prices for hotels tend to be high, but there are always deals to be found. Keep in mind, the third week of September is move-in week for students and hotels can be a bit scarce at this time with all the families in town. A hidden oasis in the middle of Palo Alto, this centrally-located and affordable hotel features grounds with a lush garden landscape complete with a koi pond. There are also two on-site restaurants that are local favorites: the more casual Dinah’s Poolside Restaurant, and the more upscale The Sea. A great option for a reasonably priced suite that includes a sitting area, a kitchenette, and a separate bedroom that makes it feel like your home away from home. Amenities include a complementary nightly happy hour with beer and wine, as well as a hot breakfast. Located on El Camino Real in Mountain View, this hotel is an excellent choice if you’re looking for a solid boutique option. The hotel itself is modern and has quirky touches like old school toys in each room and artwork scattered around the property. A hot breakfast is included. What are your top things to do in Palo Alto?